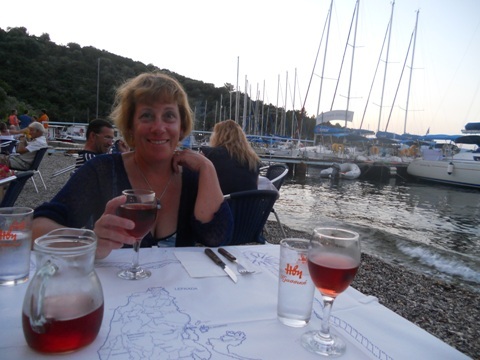 Dinner on the beach at Porto Spilia. The next day we motored to Kapali for a night at anchor, then the following day we went to Vliho to collect our new freshwater pump and rather indulgently ate out for a second night that week, at the Vliho Yacht Club. We only went for a beer, but the menu was so enticing we stayed for dinner - pork medallions in brandy & brie sauce with green beans and potato rosti - delicious, and not Greek cuisine for a change! The following morning we were up early before it got too hot to fit the new pump. I had researched the replacement pump well - I knew the new Shurflo pumps are slightly different from our original, but a UK dealer had told me that the critical dimensions are the same, and I'd confirmed this by looking at a Shurflo data sheet online, so I was expecting to only have to drill four new holes for the mounting plate. I can now confirm that the critical dimensions are not the same - the outlet heights and offsets are different - not by much, but enough. The original Bavaria installation is such that there is no flexibility for fitting a different pump - the inlet side uses rigid Whale pipe and fittings, rather than flexible hose, so new fittings are required to accommodate a new pump. So instead I fitted a spare pressure switch to the existing pump and re-installed it. That seems to have fixed the switch bouncing, but why the accumulator refuses to fill remains a mystery. I've managed to source a like-for-like one of those from a caravan shop in the UK, and I've ordered some new Whale fittings, so now we await their arrival. 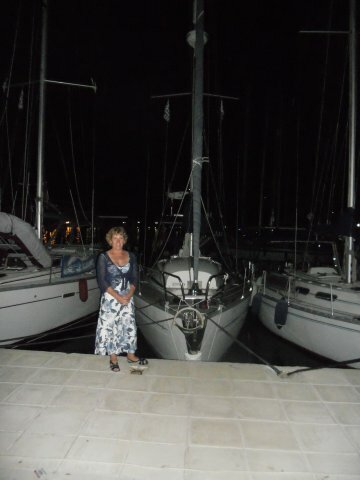 Anyway, when I first chartered a yacht from Sail Ionian on Vliho Quay in 2004, little did I imagine that a decade later I'd be trying to fix my own yacht while tied to the very same quay! 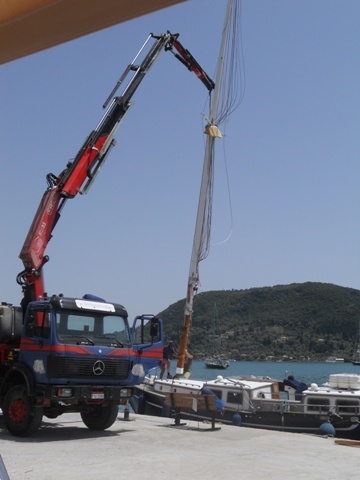 Entertainment Vliho style - a mast being re-stepped. 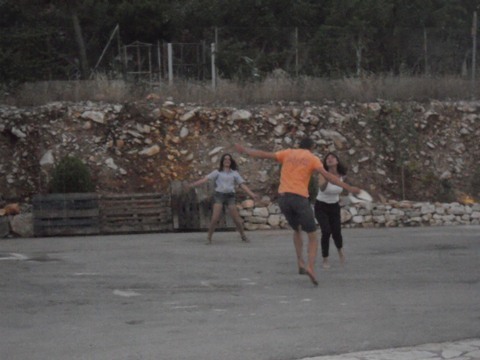 Entertainment Vathy style - Charlie winning a round of a 'grab the hat' game. The next day we sailed to Ormos Varko for a couple of nights before returning to Vathy to attend to domestic chores and on Monday we sailed once more to Ormos Varko. Don't we get bored going to the same places all the time, we hear you ask? Well no, not yet at least. And we're not alone - we've seen the same half dozen or so liveaboard boats return to the same anchorages time and again, primarily the ones where there are no shoreside facilities (therefore not crowded), good holding and shelter to suit the current wind direction. Shortly after our arrival, we spotted something a distance off in the water that looked a bit like a turtle. Even with binoculars we weren't certain, then thought perhaps, as we couldn't see any flippers, it was an octopus, but we couldn't see any tentacles either, just a round head. We then thought it may just be a stray bin liner arranged in a peculiar fashion, but then we concluded that what we were looking at was a stingray! Actually it may have been a blue-spotted ray, we're not sure - has anyone else seen one in these parts? We watched it for a while, gliding this way and that, until it dove from the surface, not to be seen by us again. After that excitement and once the afternoon katabatic winds reduced and calmness was restored, we were able to marvel at a wondrously light pollution free night sky, watching satellites tracking across the darkness. We've been thinking about replacing our Nestaway nesting dinghy with an inflatable, as launching and recovering the Nestaway is really quite difficult, not because it's heavy (it isn't - it's made of carbon-kevlar and weighs about 30kg, much the same as an inflatable) but because it is A Large Thing to manoeuvre about our foredeck, being 2.5 metres long with a maximum beam of 1.3 metres when assembled, and is really quite enormous when standing on the side deck on its transom prior to launching stern first over the toerail. So on Wednesday we tried something that I'd been wondering about for a while - would it be possible to launch the two halves of our Nestaway dinghy separately and join them together in the water, rather than on deck? Well yes it is! Both halves float independently and although we plugged the bolt holes this proved unnecessary as the holes remain above the waterline until the two halves are united, whereupon we screwed the bolts in tout de suite. Of course this option would not be viable in the cold waters of the Atlantic, at least not without a wetsuit or drysuit! We then remembered why we bought the Nestaway in the first place - she rows beautifully, and being able to row around an anchorage simply for the pleasure of it, rather than as just a means of getting ashore, in the relative cool of the early morning or evening is a joy and adds another dimension to our enjoyment of anchoring. We then tried the outboard - this has not been run for nearly two years, yet started almost instantly. Although it seems to develop full power, it won't do this or tick over without a bit of choke, so that needs investigating. Could it simply be because the fuel is three years old? On Thursday we returned to Kapali, towing the dinghy. Soon after we arrived a brisk northerly wind picked up, and remained at Force 4 or so for the next 24 hours - out to sea we could see it was much stronger than that, and the forecast was F8 to the west of Lefkada. We had the anchorage to ourselves for two nights, in July - probably because Kapali is open to the north, but we were confident our anchor was well in. Incidentally, we have taken to reversing out of anchorages - can you think why? Today, we have returned to Vathy to watch the Wimbledon finals - we have Pimm's & ginger ale in the fridge, ice in the ice box, just need to pop out for some strawberries and mint - yamas! Finally, just a reminder for those of our readers who do such things, you can follow our more immediate ramblings & musings via the Facebook and Twitter icons at the top left of each page.